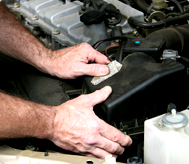 We will repair any car, ranging from changing a set of brake pads to a full engine re-build. All repair work will be carried out by a fully qualified and experienced technician using genuine or original specification parts. Miller cover all the models within the BMW vehicle range; we can give you an X5 service, M3 service or BMW 1 series service to the standard you would expect. German prestige cars like the BMW must be maintained at the highest level, making sure approved parts and oils are used, to ensure your BMW car is running at is optimum level and warranty is protected every time. Modern BMW's and Mini's are highly complex machines; all of which rely on at least one or more on-board computers. When a fault develops with the vehicle the computer recognises the problem and registers the details. Our cutting edge, dealer-level diagnostic tools allow us to carry out comprehensive diagnostic discovery and repair of faults on the latest vehicles - allowing us to identify and rectify any faults in a timely and cost-effective manner. We offer the same service as you would get at your Dealer, but at times suited to you, and at a fraction of the cost. We are also one of only a handful of independent garages able to offer you this service. The diagnostic scanning process takes around an hour to complete and when finished provides us with a comprehensive list of any faults your vehicle's computer has identified.